Sacred cows are not necessarily a problem. Just because something is sacred, that doesn’t mean it can’t also be useful. Make the most of them. Eco Mower, a photo by webmink on Flickr. 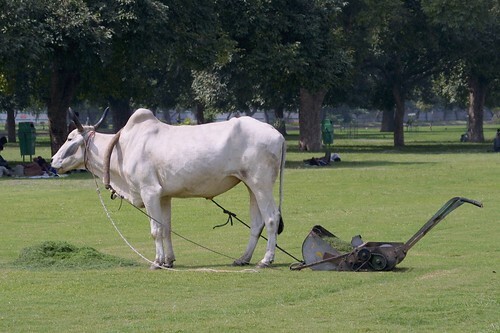 Cows are respected as a symbolic spiritual presence in India. They roam the streets freely and are described as “sacred”. I took this photograph on the Raj Path in Delhi. One of the gardeners there was using the cow to pull the lawn mower, and rewarding the cow with luscious grass clippings. All very eco-friendly and practical!